Intel's 7th generation core processor contains "next generation" as many meanings. This is because, with the 'next generation' aspect of the product itself, it provides the function and performance for preparing the next generation environment such as 4K display and VR together. 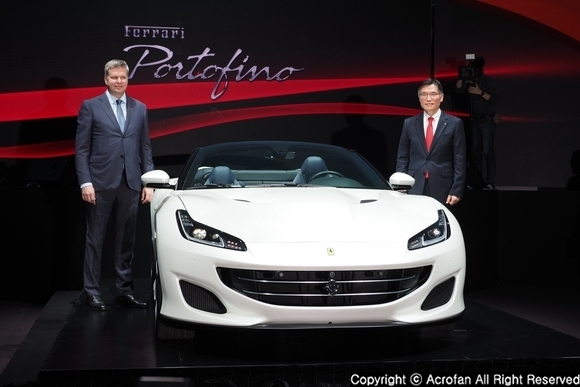 In addition, the changes in the technological composition within the product lineup that has been continuing for several years have begun to appear more prominent in this generation. 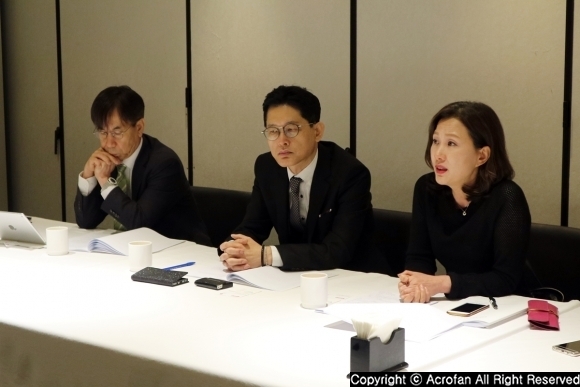 In particular, beyond the existing 'tik-tok' product development strategy, the rise of 'PAO' strategy pursuing a gradual change over three generations is now in the process of being formalized. 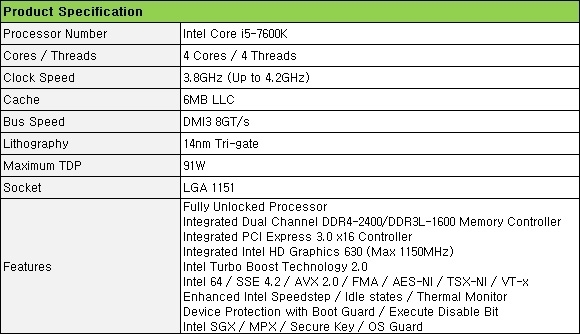 The test system used Intel Core i5-7600K processor and ASUS B150M-A mainboard based on Intel’s B150 chipset. Core i5-7600K processor has basic 3.8GHz and maximum 4.2GHz operation speed, and it can be used as a BIOS update on the existing 100 series mainboard. However, overclocking is not supported on B150 chipset-based mainboard used for testing. The memory is a 16GB dual-channel configuration using two DDR4-2400 8GBs and has been tested on a 120GB SSD and the latest version of Windows 10. The tests confirmed the performance differences from the previous generations in aspects of basic calculations and graphics as much as possible. Especially, the 7th generation core processor has significantly increased the operation speed compared to the previous generation, and there are a number of products that achieved the symbolic 4GHz operation speed. On the other hand, even though it is the latest hardware, there was not much difficulty such as obtaining a driver to use it. In particular, the graphic driver was able to user the latest driver automatically provided by Windows update normally. 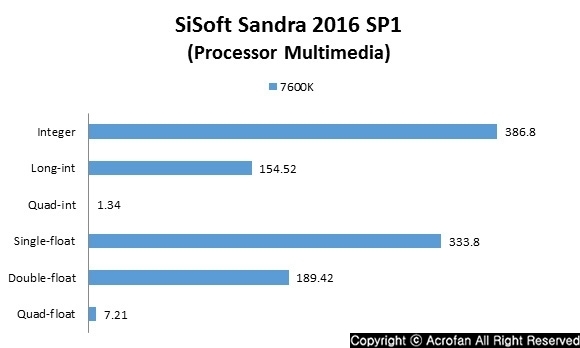 At a result of the SiSoft Sandra 2016 SP1, which can demonstrate traditional arithmetic performance, you can clearly see a significant improvement in operating speed over previous generations. 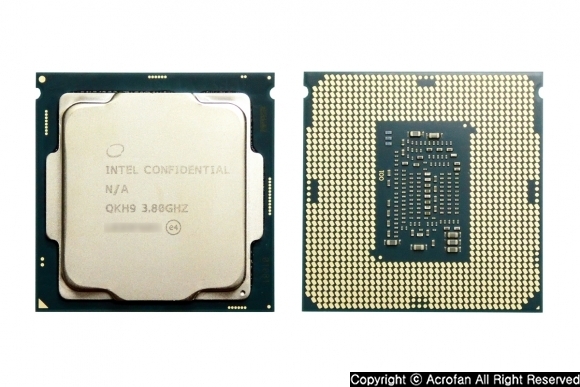 While the previous generation of Core i5-6600K showed 3.7GHz operating speed with turbo boost applied full-load, the current i5-7600K can expect 4GHz operating speed under the same conditions. 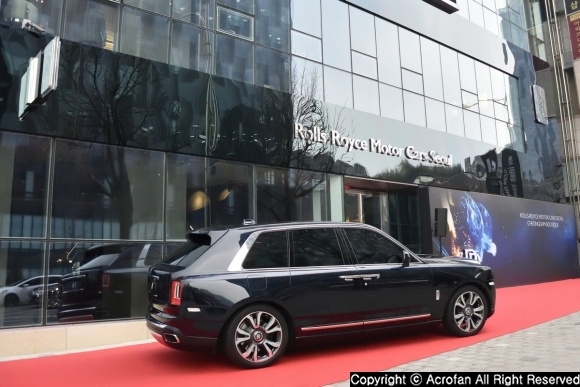 Even though the changes in the architecture are not well known, it is obviously a visible improvement in performance. In both basic and multimedia performance, Core i5-7600K shows a 10% performance improvement over the previous generation, the i5-6600K, which closely matches the change in operation speed compared to the previous generation. It can be interpreted that the processor part of the 7th generation core processor is not changed much compared to the previous generation, but there is a need to be aware of that the aspect of the 7th generation core processor's advanced technology is not reflected such as 'Speed Shift'. 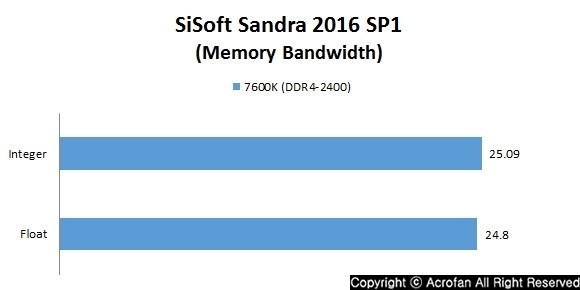 As the memory bandwidth supports DDR4-2400, it became possible to expect better performance. The difference in performance between DDR4-2133 and 2400 in dual-channel mode is an improvement of 2 GB/s bandwidth. 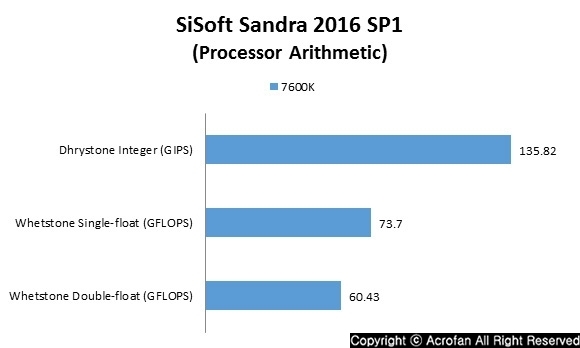 However, this improvement in performance is not meaningless considering that it affects the overall system including the GPU built in the processor. On the other hand, as most DDR4-2133 memories can be used without any problem in DDR4-2400, the improvement of memory controller seems to be approaching as a more practical meaning. 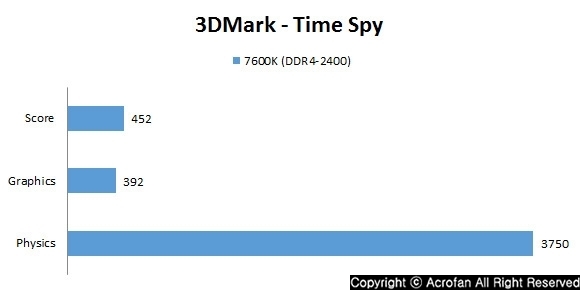 At the 3DMark test results, which can measure performance in gaming, show a performance improvement of higher than 10% over the previous generation. In case of GPU, it is based on the same 9th generation architecture, and it is known to have the same operation speed. However, improvements of hardware, memory controller, and driver seem to have affected. Intel's driver completions after the 4th generation of core processors are now almost professional, and the generations of 6th generation core processor are introducing a separate beta driver to respond to some of the latest games. 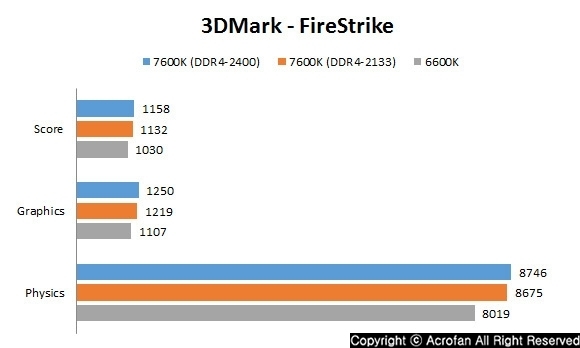 In 3DMark's Firestrike test results, i5-7600K's built-in GPU 'HD Graphics 630' scored 1,158 points, which is a 12% improvement over 1,030 points at 6600K. In detail, there was a 13% increase in the graphics score and a 9% increase in the physics score reflecting the processor performance. And the graphics performance improvements are expected be affected by hardware improvements and enhanced drivers, and the difference between DDR4-2400 and 2133 of the memory controller was not as significant as the error range. 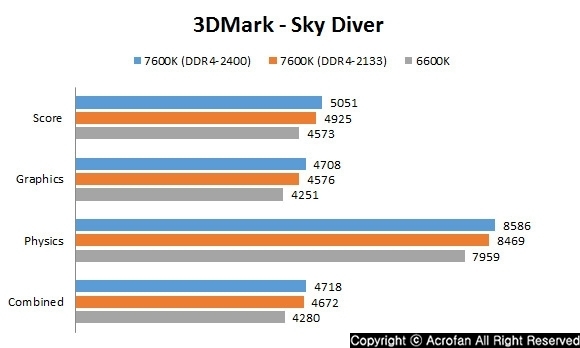 In 3DMark's Sky Diver test, i5-7600K showed a performance improvement of about 10% compared to i5-6600K, and a performance improvement of about 8% in physics performance. In addition, the score of Time Spy test that can run on Windows 10 and DirectX 12 is low as 452 points, but it is enough to support Windows 10 and DirectX 12 environment properly. 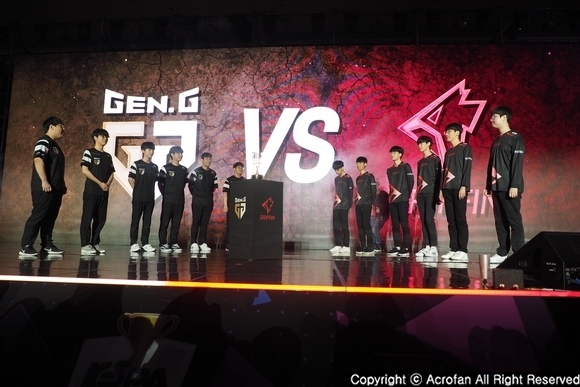 And because it provides the basic performance to enjoy popular games now, it could be said that the entry-level GPU's competitiveness is high. The PCMark test, which can estimate the overall productivity of PC, shows some interesting points. 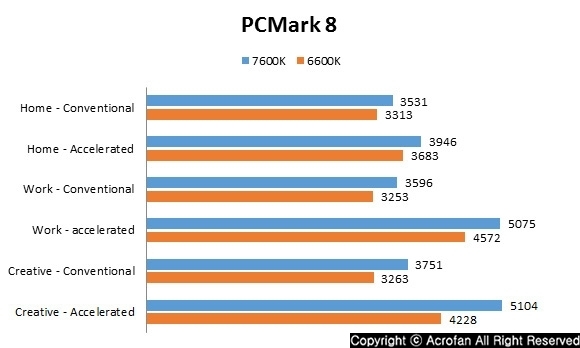 First, compared to the previous generation, 6600K, there is a slight difference in system configuration, but overall, we can see that the score has risen. Especially, GPU acceleration shows a noticeable improvement in performance. This reflects the improved utilization performance of GPU's OpenCL, along with processor’s performance improvement, especially when using GPU from 'Work' and 'Creative'. The results show that the characteristic of processor built-in GPU is better suited to the use of productivity-related applications that utilize the GPU rather than gaming performance. In particular, OpenCL acceleration and multimedia related hardware acceleration using the built-in GPU of the 7th generation core processor are also elements that raise the value of PC utilization in terms of productivity. Therefore, the performance enhancement in PCMark is expected to improve the actual performance that can be felt more than the improvement of the other calculation performances. 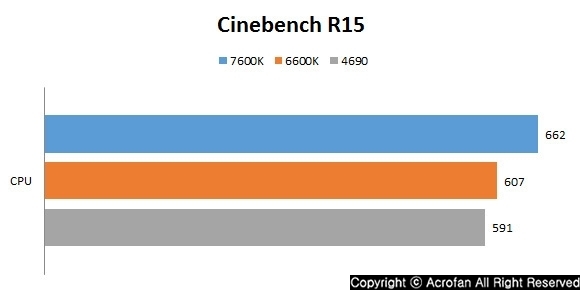 In the Cinebench R15 test, which reflects processor performance, Core i5-7600K showed 9% higher performance compared to 6600K, which seems to be affected by the improvement of operation speed. 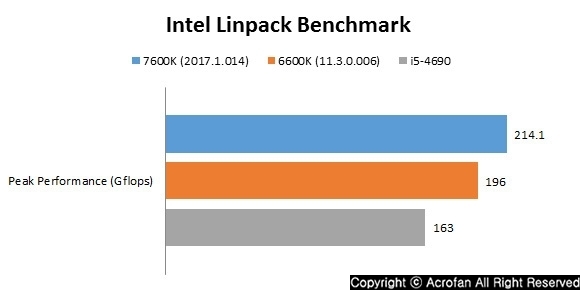 Moreover, in the Intel Linpack test based on the latest library, 7600K showed 9% higher performance than 6600K, and the difference was even greater when compared to old library-based test of 6600K. 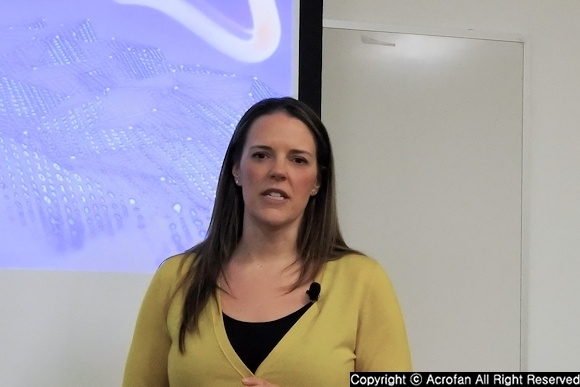 This demonstrates the need to have the latest operating environments and applications to support them in order to maximize the potential of modern processors and platforms. The Intel Core i5-7600K is more than just a new product, meaning more than a change in the product itself. 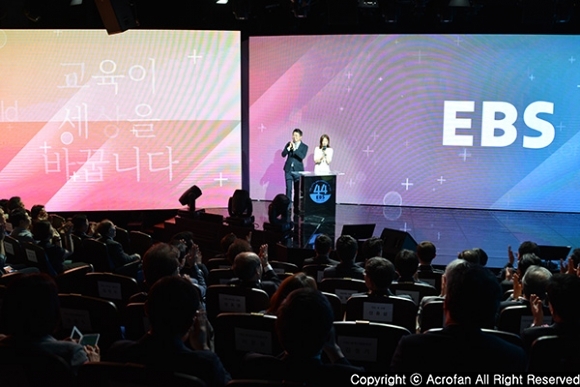 First, it emerged as the 'optimization' phase of the new development strategy 'PAO', ensuring Intel's plan about the uncertainty in the future journey in the market, and signaling continued improvement in all aspects of process, architecture and platform. 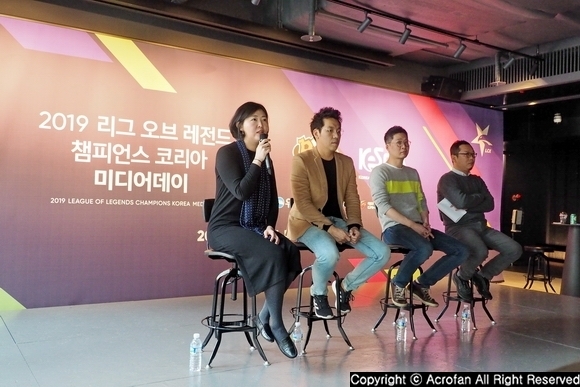 Also, the desire to approach the next generation environment such as 4K display and VR is reflected in products. At the same time, an interesting thing that can be found in the 7th generation core processor family is the change in technological positioning across product families, including the K-series. That K-series with overclocking capability appeared in Core i3 family, that the aspect of performance is clearly differentiated between K-series and general products, and that Hyper-Threading technology is applied to 'Kaby Lake'-based Pentium family can be considered change as much as it was at the time of introduction of the 6th generation core processor. Due to these changes, Core i5-7600K has a slightly different character. If the previous Core i5 K series was a processor that had no reason to choose it, unless overclocking is the goal, the core i5-7600K now has the appeal of reaching users who want higher performance even without overclocking. This policy has also been introduced in the 6th generation Core i7 K series, and it seems that Core i5-7600K has obtained clearer meaning of its existence with both high performance and overclocking.